Count to 10 - Apple Tree - Kindergarten Counting Fun! 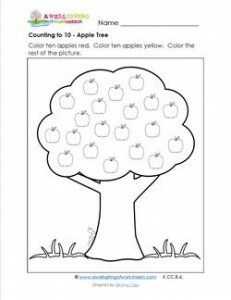 Kids can reinforce their counting to 10 skills with this apple tree worksheet. You’ll need some crayons for this one. Color 10 apples red & 10 yellow. Look for the hungry worm!